On Wednesday, May 6, 2015, our global community will come together for the ninth International Day Against DRM. 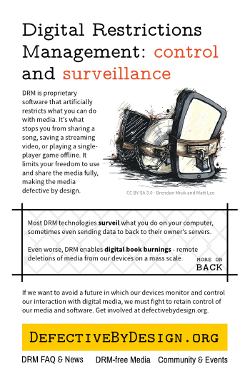 We'll be gathering, protesting, making, and sharing, showing the world and the media that we insist on a future without DRM. We expect this to be one of the biggest, most diverse Days of action against DRM ever. Print the double-sided flyer in color or black & white. Check out the growing list of events on the LibrePlanet wiki. More coming soon! Join the announcements list and tell us where you live to get notifications about new events held by like-minded people in your area. Get your friends together and plan an event. This year we've even got an event planning guide and a shiny new flyer (translations coming soon!) for you to use to spread awareness of DRM in your community. Not into flyering? The site has a list of other ideas for events. Whatever you choose to do, let us know at info@defectivebydesign.org and we'll be glad to answer any questions you have and promote it to people in your area. We recommend you also add it to the list as soon as possible, even if you haven't work out all the details yet. Translate our flyer into your language. Even if you can't hand it out in your country, someone else might. All translations will be posted on dayagainstdrm.org as they are completed. We've set up a translation area on the LibrePlanet wiki. Please be sure to read all instructions before you begin. Draft a blog post or make a video talking about the dangers of DRM, and get ready to post it on May 6th. Feel free to contact us if you'd like advice or help. We'll keep in touch with more info leading up to the Day, when we'll use the site to coordinate actions and events. Until then, let's spread the word so that this can be the most powerful International Day Against DRM ever. P.S. Are you affiliated with a business that sells DRM-free media? If so, we'd love to help you join the shops offering promotions for the International Day Against DRM, and tell our supporters about your business. Just email info@defectivebydesign.org for details.